Would you like to improve your hair's strength, volume, and shine? Then you might want to try NeoCell Keratin Hair Volumizer. Just take 2 capsules a day and you are on your way to healthier hair. Not everyone eats the right diet to get healthy, strong hair so thankfully there are supplements to help those who don't out. I do have to warn that there might be sulfite residue, which is a known allergen in our family for our 12 year old so we keep these out of reach. Although she is now old enough for us to tell her and she will stay clear we do it just in case. 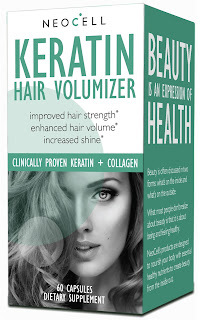 You can find out where to buy NeoCell Keratin Hair Volumizer here or purchase on Amazon. One lucky MarksvilleandMe reader will win NeoCell Keratin Hair Volumizer value of 16.77. Open to USA residents only from 6/2/2015-6/16/2015 12:00 AM ESt. MarksvilleandMe is not responsible for prize distribution that will come from NeoCell. MarksvilleandMe wishes everyone who enters Good Luck! What NeoCell has to say about their product. Disclosure: MarksvilleandMe received one or more of the products mentioned above as part of a promotion with Tomoson and NeoCell. Regardless, MarksvilleandMe only recommends products or services we use personally and believe will be good for our readers. Some of the links in the article may be “affiliate links.” This means if you click on the link and purchase the item, I will receive compensation. If you would like MarksvilleandMe to review a product or service please contact us at marksvilleandme@gmail.com.